People need to hear the message of hope, the good news of the Gospel of Jesus Christ. 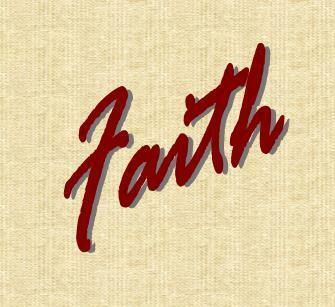 Where is your faith? If you have never accepted God's Son as your Savior, you are wandering aimlessly with no hope, headed for God's eternal judgment. Today you need to put your faith in God. Listen to this video to find out how. What you believe makes a big difference in how you live your life. The Bible has very clear teaching on how you are to live your life. You will find the series, "What To Believe" helpful as you build your own biblical value system and share your faith with others. Listen to these 16 sermons with an open mind and ask God to reveal truth to you. My prayer is that you will be abundantly blessed as you study God's Word. We believe the Holy Scriptures of the Old and New Testaments to be the verbally inspired Word of God, the final authority for faith and life, inerrant in the original writings, infallible, and God breathed. We believe in one Triune God, eternally existing in three persons -Father, Son, and Holy Spirit-coeternal in being, coidentical in nature, coequal in power and glory, and having the same attributes and perfections. Every society is built on principles andvalues. Today our society is confused as they have replace God's values with their own opinions and ideas. It is time to change our habits. Its time to see what God expects of us. As you listen to and practice these ten godly habits, your life will be changed, and your influence will change the lives of others around you. It will give your life new meaning, purpose and hope! Jesus was the greatest teacher of all. He took earthly stories that we could understand and mixed in heavenly truth. If we want to succeed, we need to learn from Him. What Do I Owe Me? Luke 11:29-36 Jesus had been teaching His disciples some important lessons about life. The first was about prayer, and the second was about how important it is for us too choose which side we are on. We cannot go through life sitting on the fence. He then focus on setting our priorities and being a light. Are you light sensitive? Luke 14:1-35 Do you like being invited to someone's house? Does it matter where you go? Jesus was invited to a very important Pharisee's home. Poor people were not invited and usually no women. These invitations were a status symbol. As they were sitting and eating there was a lot of talking. It was not wrong in those days to come up to the window and listen in to what was going on inside. Step up closer and lets listen in. Do You Need An I Examination? Luke 18:9-17 Jesus teaches on how we should pray. Is it all about you? Listen to the lesson He has for us today. Luke 18:1-8 Is prayer an answer to life or a waste of time? Does it really pay to pray? Jesus teaches us about prayer in this parable. Listen and learn more as the Master teaches us. Read It, Hear It, Do It! The name of God is never mentioned in this little book, but His presence is very clear. There are a lot of lessons we can learn for the life of Esther that will help us as we live in our present day and age. Esther 1:1-22 Pride will causes us to do things that we should not do. Foolish decisions were made because of it and there were some terrible consequences. Listen to learn how to avoid these pitfalls. Esther 5:1-14 Does prayer really make a difference. Watch this video and see how it was instrumental in the life of Esther and her difficult situation. Esther 6:1-14 God often tests us right to the end. In Esther's situation it meant trusting God with her life. How much do you trust God? Watch this video and be challenged by it. Is There Still No Room? Luke 3:1-4:44 Jesus, our Creator and Savior, was introduced to this world at His baptism. God showed His approval for Him and He showed us how to overcome temptation. Listen and learn about God's great gift to us. There have always been those who have twisted the truth and created something else out of it. Peter recognized this and in this book takes the time to help us understand this things. He gives us instructions on how to be careful as true followers of Christ. Listen to this series and grow in your Christian walk today. John, in his gentle loving way, communicates to us about truth. You will be challenged to new steps of faith as you listen to this series. In I John 2:18-29, John makes it clear in today's text that we are either triumphing or tripping in our Christian lives. We are either real or pretend. Listen to what he has to say about the times we live in, the test of our sincerity, and the truth about it all. I John 3:1-10 Our world needs God's love. How can they understand this message of hope. Listen and find out what God has for you. I John 3:11-24 What are our relationships like today? In our society we see an alarming increase in divorce and dysfunctional families. Is there an answer? Listen to what this passage has to teach us. I John 4:1-16 Real love is obvious. It stand out and makes a difference. As you listen to this sermon notice the test of love, the truth about love, and the testimony of this great love of God. I John 5:6-21 teaches us about how faithful God is. We fail but He never fails. Listen to this message and be encouraged to trust Him more. In II John 1-13 we learn about truth. What is truth? Today our world is clouded with so many half truths and down right lies that we begin to wonder if truth can still be found. Listen to this message and be encouraged that truth is still here and find out where you can find it. III John 1-14 John gives a real perspective on the church. He gives the church report card. In John's report he gives three A's, two F's with some specific warnings and planned conferences. Listen to his evaluation in this sermon. Jude gives us the meaning of life. He shows us the difficulties of walking God's way and then leaves us with a formula for change that will prepare us for our end. Listen to this sermon and make sure you are prepared.